At PAWPS students reading abilities are assessed using the PM Running Record Kit. This is a comprehensive reading assessment resource that has been designed to explicitly assess students instructional and independent reading levels using meaningful texts. Students have access to books that are levelled (based on the above targets), colour coded and placed into Reader Tubs that are then allocated to classrooms. The levels are divided into lot of three (as there is not enough room in a class to have thirty reader tubs). Therefore, if your child moves up a level or two, they may still be on the same coloured reader tub. The diagram below shows how levels and colours are displayed on readers tubs. 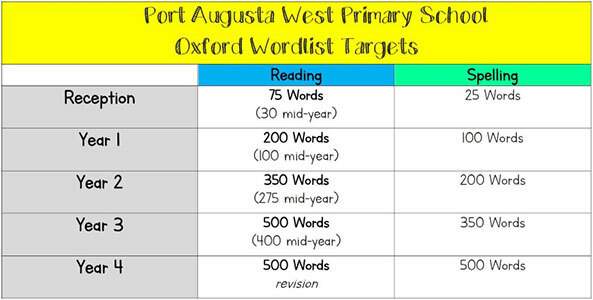 As of 2018 PAWPS will be implementing the introduction of the Oxford Wordlist as Sight Words. The Oxford Wordlist identifies the top 500 high-frequency words that children use today. We have set sight word targets to be achieved by the end of each year level. The 500 words have been separated into 20 lists, each list containing 25 words. This makes it easier for assessment and student tracking for set year level targets. 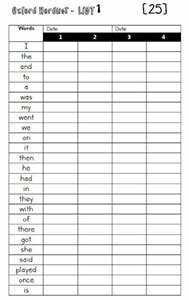 Teachers will send home a new list once students have successfully read the words on 4 occasions and the teacher deems the student is able to demonstrate automaticity when reading the words. It is important students are reproducing the words automatically as it ‘frees up the brain’ to concentrate on higher-level strategies when reading and writing. In conjunction with reading the Oxford Wordlist, students will also focus on the spelling of these words. This process will consolidate students’ learning of the sight words and allow for lifelong recognition of familiar words. This process falls in line with the DECD requirements and aligns with the Australian Curriculum. For your Information: Jolly phonics provides a thorough foundation for Reading, Writing and Spelling. This program teaches 42 main sounds of English, not just the alphabet letters. Each sound has an action which helps the children to remember the sound that it represents. Some sounds are made with two letters which are called diagraphs e.g. “ee” as in sheep and “ai” as in rain.